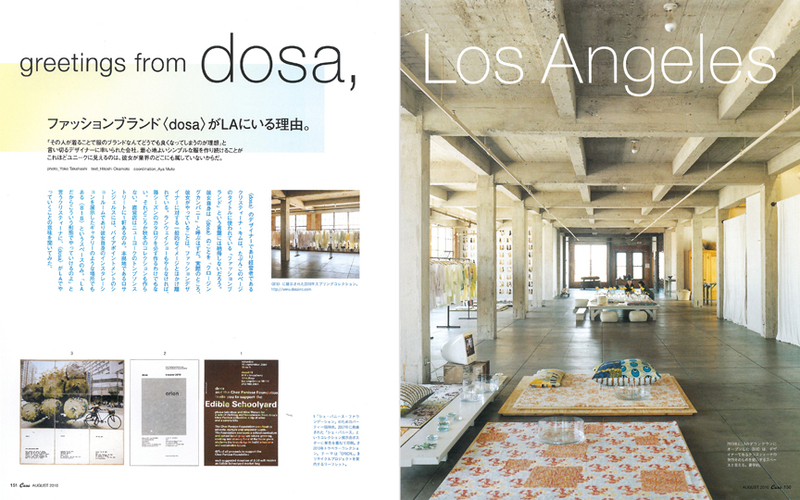 A few reasons why the fashion brand dosa is based in LA. dosa's designer and owner, Christina Kim, would perhaps argue with the term "fashion brand" that we used on the title. In her own terms, she would probably call dosa a clothing company. In truth, what she is doing is quite a leap from the general notion of what fashion designers do. She does not do runway shows, nor make a catalog for each collection. Not only that, dosa never does a Fall/Winter collection. The storefront retail is on Thompson Street in NYC. 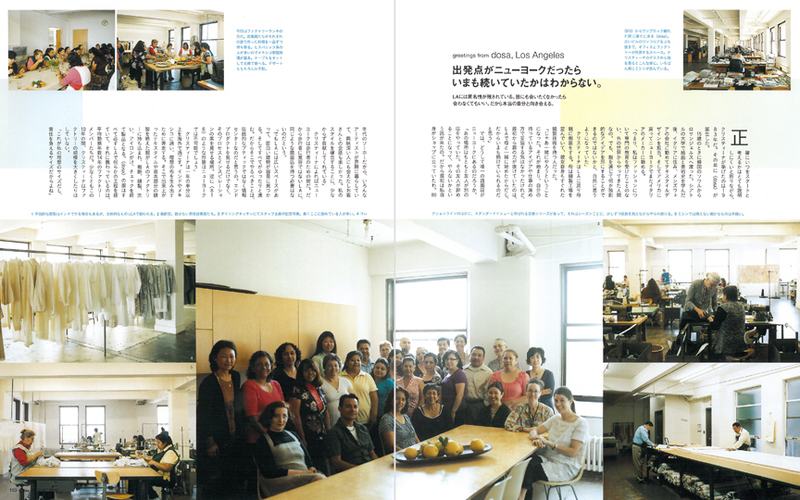 In Los Angeles, where dosa houses its base, there is a show room and retail that people can visit by appointment only. This is 818, where Christina also brings in her various installations, and depending on the project, turns into a gallery-like space all in one. "We can do this because we are in LA" says Christina. We visited her to learn why that is so. CK: We would not have been the same, if I started this in New York. Los Angeles allows anonymity. You can choose not to see anyone if you prefer. That allows you to truly face yourself. She excuses herself because it is difficult to state when exactly this has all started, but she settles on the year 1983 as the founding year of dosa. Christina Kim came to Los Angeles from Seoul, when she was 15. After studying painting and art history in Seattle, she lived in Italy and designed textiles at a men’s wear brand. She eventually returned to the US, to New York, and worked for another Italian brand. "The fact is that I have never been educated in fashion, in a way I am an outsider. But I gradually grew into the notion of how I could express unique ideas through clothes." Christina returned to LA to discuss this with her mother, who happened to be running a clothing company in Los Angeles. Her mother was also a talented sewer herself. "We then decided to work together. That is how it all started. I never have compromised my ideas or how I deliver it, but to be able to have this attitude is because I started this in L.A. and initially, with my mother. This is probably why I can continue to do this to this day." Then why is the sole retail store front in NYC? "That was a location where my friend had her store. She decided to close her store, and asked me if I was interested in taking over the space. So at the very beginning, I was there at the store myself. This was SoHo in the '80s, so many artists lived in the area, and I encountered many interesting customers as well as conversations. I really feel that this period of time contributed a lot to establishing my own style." According to Christina, NYC is a pedestrian city. She felt that cities like LA, which is not a pedestrian friendly town, did not need a store front like that. "But LA is abundant with space, and full of interesting structures too. And everything strides in a slower tempo. I felt that what I should do here was to establish an information center, instead of making a store front boutique, not only showing the end product, but be a place that shows the process and the inspiration. On the other hand, a space like 818 is close to impossible in NYC." Christina spends half of the year traveling. India and Mexico become her workstations to develop her ideal fabrics. The textiles and garments in basic stages will then come to the LA factory, where the patterns are cut out, and fine sewing is applied. Washing, ironing, and quality check happens here too, and the product is born. All dosa garments go through her LA factory at some level, handled by factory members whose years with the company averages out to 14. At least for this past 10 years, Christina has not tried to enlarge the size of the factory. "This is the perfect size for dosa, and also for me to be responsible to." Today is a factory lunch day. All factory members have brought in a dish of their specialty to the communal serving table. There are many from different backgrounds, so here you see a variety of home cooking from Mexico to El Salavador to Guatemala. The table is set up, and everyone eats together. Dessert of course is home made too. There is a lot of space here in LA, to allow you to think outside the box. By having nature at the doorstep, the surprise factor is always there and unique creativity is sustained by not requiring unnecessary competitions. Through her travels, what she saw and heard will become an essential inspiration in Christina's clothes making. Does that make LA a perfect place for her to give it a shape? 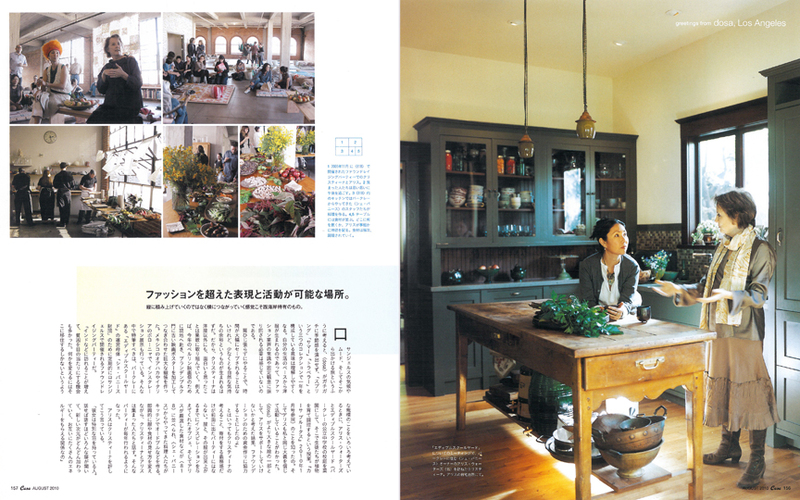 "Not only that, LA also gives me a lot of things. Many come from my experiences in nature, and you'd be surprised how much nature you find in LA. I saw a coyote yesterday when I was driving, and I saw a deer hopping in the hills when I was playing tennis. This all allows me to stay humble, remembering how small of a being I am in this whole wide world." To immerse herself more into nature, Christina decided to move to Mt. Washington from her long time residence in Silverlake where she is currently living in a 1938 Richard Neutra duplex. For many years, her downstairs neighbor was Larry Schaffer of OK store. When Christina thinks of her new house, she refers to the Schindler House (MAK Center) as a big inspiration. 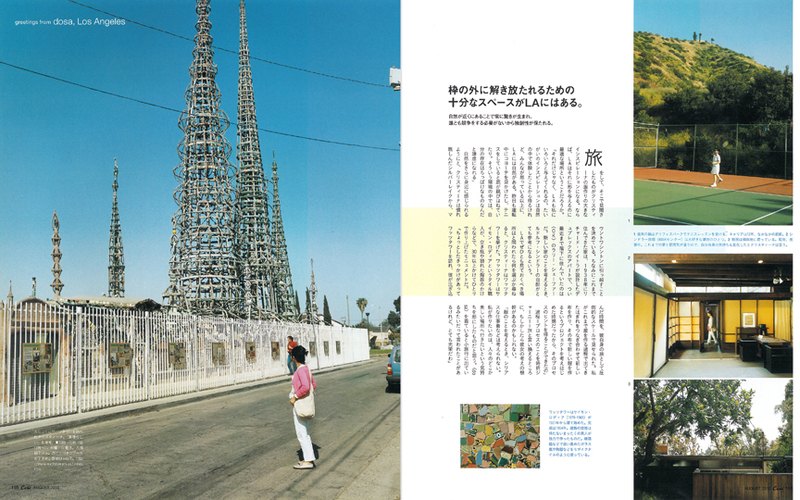 Christina brought up Watts Tower as a must see in LA. The Watts Tower was made by Simon Rodia, a tile worker, who set out to build this monument using broken bottles and ceramics. "With chains of coincidences, I had a chance to visit Watts Tower and I saw Simon's time and journey in this monument of grand scale. That was also a time when I started to work on using the scraps that I have collected all along, and to make a new textile from them. I was inspired to find a hint in Watts Tower for my own process of creative execution. "When I think of clothes making, I cannot think of serious work clothes. What I intend to make is something that embodies people's desire to travel somewhere beautiful. I am so honored when people tell me that wearing dosa is like taking a small trip." Not building upwards, the west coast nature allows things to connect horizontally. Considering the climate and mood of Los Angeles, and to think of a journey starting from there, it makes most sense for dosa to shed the idea of traditional fashion seasons, and work loosely but elegantly with just the Spring/Summer/Traveler collections in a year. dosa clothes are born from the basis of Christina's day to day life, and she does not need to follow any fashion industry standards and rules. Taking a slow stride does not always save time, but it does allow a natural space in the mind. That attitude allows Christina to take on other projects that interest her, outside of her garment endeavor. This year, she headed to the Berlinale (Berlin International Film Festival) to set up a huge movie screen curtain at Brandenburg Gate, which was sewn into a big fabric from recycled movie posters. She also has done installation exhibitions in Oaxaca, Mexico and Bologna, Italy. Amongst the many things Christina does is the annual fundraising party that she hosts at dosa818 for the Chez Panisse Foundation and the Edible Schoolyard. "Through my work, I have had many opportunities to travel to countries like India, and have seen the suffering & poverty there. But it is such a big issue that you have to move there in order to make any change or at least have that deliberation. But that is something I cannot do, so I was conflicted inside me. Then I met Alice and saw her efforts in Edible Schoolyard program (please see Casa BRUTUS 10/2010 issue for the details on ESY, the program started in Berkeley's public middle school. The students tend the edible garden, and also cook what they harvest.) I immediately understood the principle that was moving Alice. I started to think of ways for dosa to contribute as part of a bigger picture, and the fundraising event was my way of “bringing something to the table." The fundraising party does not interfere with Christina's principles or philanthropist efforts. What greets you are dosa garments, the design inspirations, and a fine selection of seasonal food offerings by Alice. Chez Panisse chefs are present in the kitchen, preparing tasty hors d'œuvres. Constantly improvising the garment and food displays, Christina and Alice greet the people that come to the event. The fundraising has been an annual event for the last couple of years. "Christina has a special set of wings. More you talk with her, a new door opens up, and new dimensions are added. We feed each other lots of energy in our relationship."